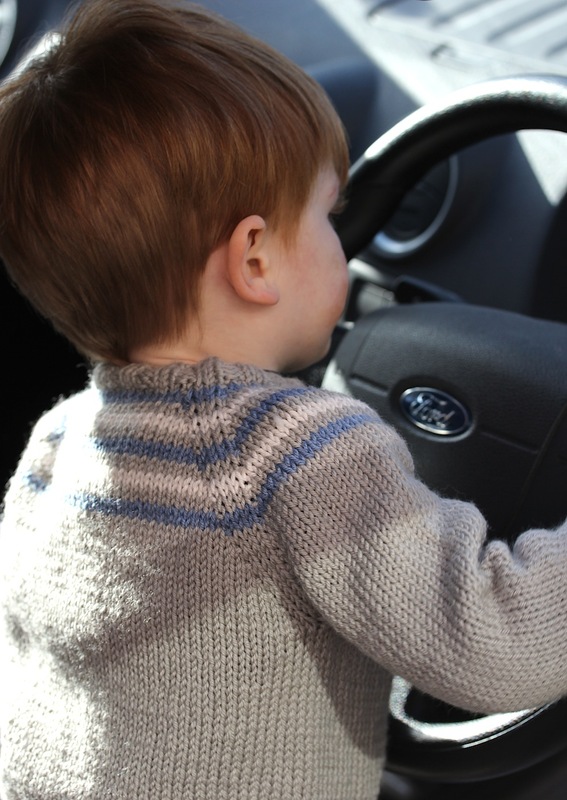 When I first started writing this blog, 3.5 years ago, the sproglet was just three months old and none of my siblings had any children. In the time since, there’s been the arrival of another six babies in our family: my next sister down has had a son and a daughter, my brother a son, and, of course, I’ve had the littlest as well. And last month, my youngest sister had her very first baby, an unbelievably adorable little girl. This is brilliant for all sorts of reasons. I’ve got lots of lovely nephews and nieces to enjoy, the sprogs have lots of cousins the same age as them for sprogging around with and, on top of all that, I’ve had plenty of opportunities to indulge my love of newborn knitting. It’s turned into a bit of a tradition that I knit a blanket for the first born in each family (this grey one for my first nephew and this stripy one for my second). 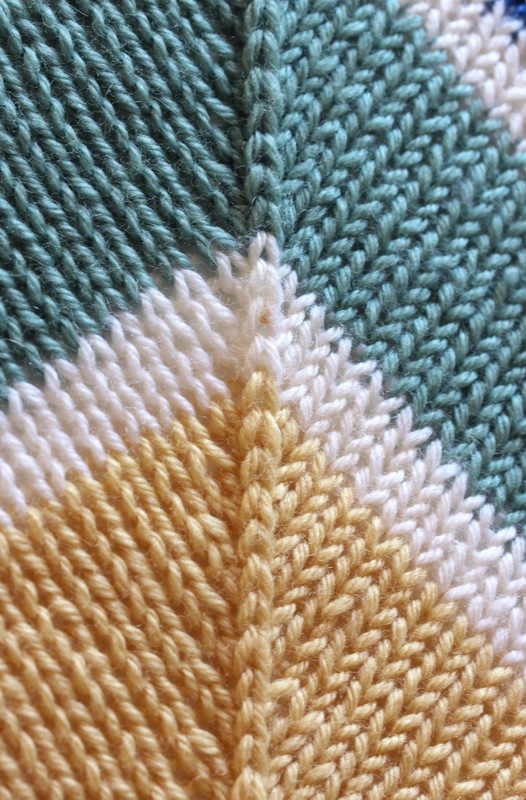 So I turned, once again, to that enjoyable pastime of browsing baby blanket patterns on Ravelry. 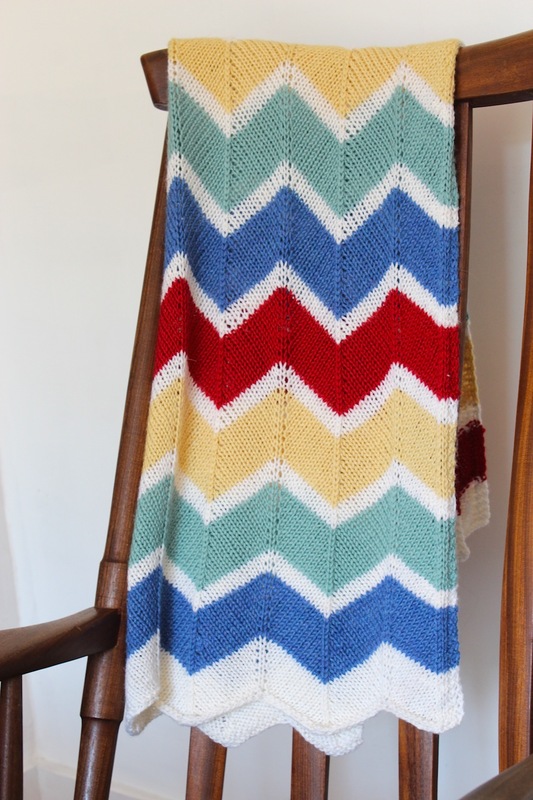 This time round I went for a solid coloured blanket in a waffle knit pattern. 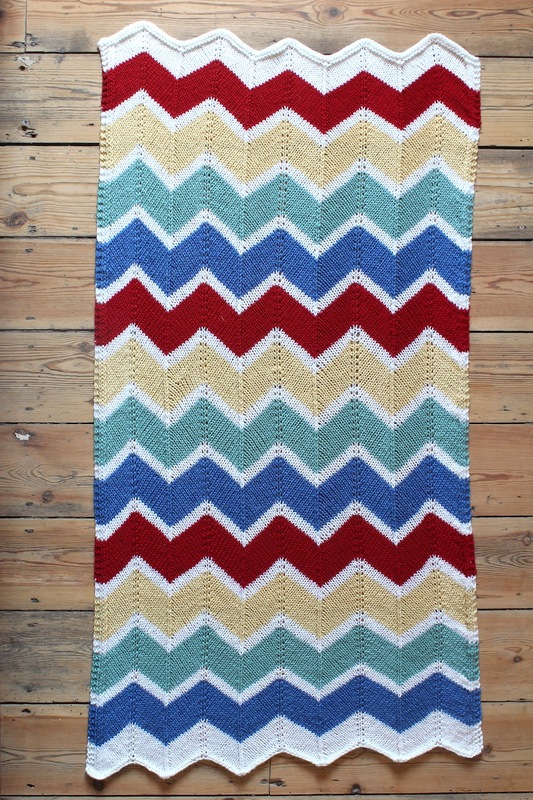 The appropriately named waffles blanket from Tin Can Knits. Once again, I’m delighted with the finished result. It’s a lovely squishy blanket, that will be really soft and especially good for colder months. And though I do love to knit a lace pattern, I think it’s probably quite good that there are no holes for tiny fingers to get stuck in. I gave it to my sister a few weeks ago, (erm, yes, quite a bit late, I’m ashamed to say) and she was delighted with it. Honestly, I’m not sure there’s a more pleasing present to give in the world than a hand-knitted item for a newborn. 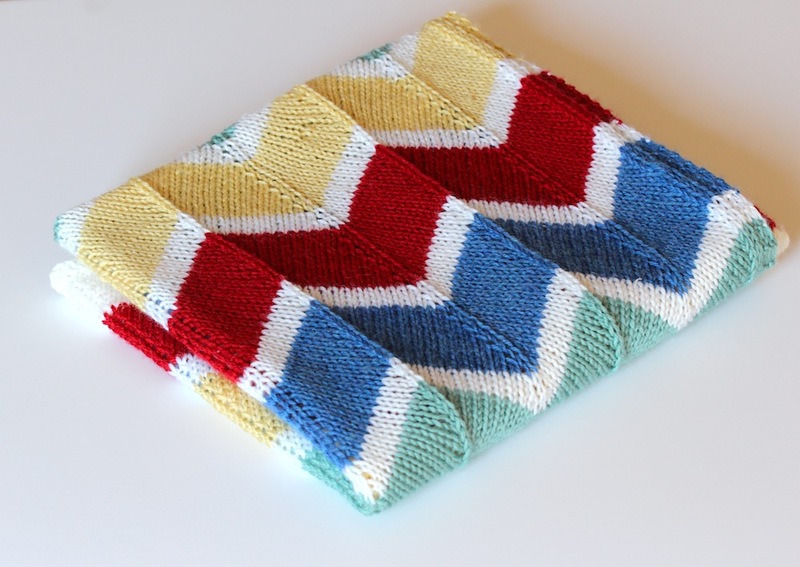 Pattern: Waffles from Nine months of knitting by Tin Can Knits. Download available for $6. My Ravelry page is here: new baby blanket. The pattern was straightforward and simple to follow. 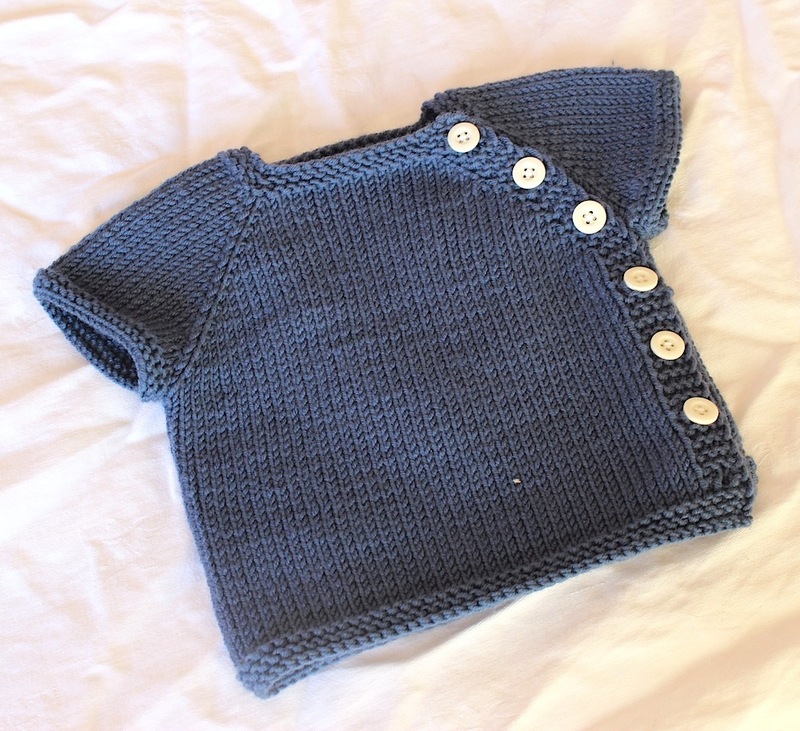 No need to re-read the pattern after the first repeat, and an easy, relatively quick knit. I didn’t alter it in any way and just kept going until the blanket looked about the size I was after. After blocking, it stretched considerably, mostly width-ways, but more lengthways than I had anticipated as well. Wool: I used a yarn that I’d tried before and knew lasted and washed well. (It’s essential to be able to wash a baby blanket in a washing machine, I think. The chances of it getting fairly frequently covered in either poo or sick are pretty high in those early months.) It’s the cashmerino aran by Debbie Bliss. Not the cheapest, at around £5 for 50g, but a really lovely wool that feels soft and wears well. I used a total of 5.5 skeins, so it cost me just under £30. The colour is called “peacock” and it’s a lovely rich teal, which I thought was pleasingly gender-neutral when I chose it. Actually, after I’d knitted it up, I thought the blanket looked very blue, but my sister shares my opinions on the ridiculousness of gender stereotyping small babies, so she’s perfectly happy for her baby girl to be encased in a blueish blanket. 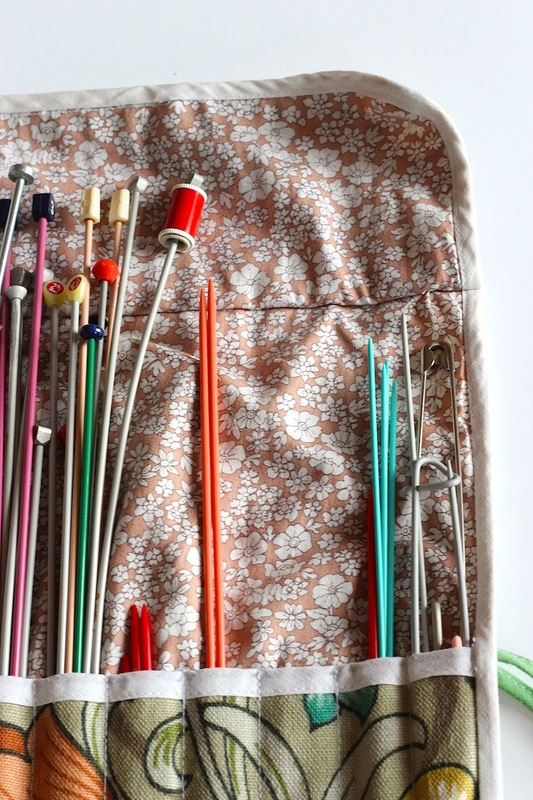 Now, what to put on my needles next? Never has anything I’ve knit been met with such enthusiasm as this chunky green and mustard jumper. Before I had even got the wool on the needles the sproglet was already endearingly excited about the prospect of a new jumper. After such an unexpectedly amazing first response, I thought things could only possibly go downhill from there (you know, with a finished result of a jumper that was absolutely never taken out of the drawer) but every few mornings he would ask to check on my latest knitting and say endearing things like, “Oh Mummy, I love the back!” as I showed him each part. The finished result was just as appreciated and after he tried it on for the first time (and told me how it was his favourite thing ever) he asked, “Am I really allowed to keep it and wear it?” as if I might have just given him something incredibly precious to touch for a few minutes before whisking it away back to a vault somewhere. Now, whenever he is wearing it (which is most days) and someone compliments him on it, he always, but always replies, “My Mummy knitted it for me” with a big proud smile on his face. Adorable. Unexpected. And utterly adorable. 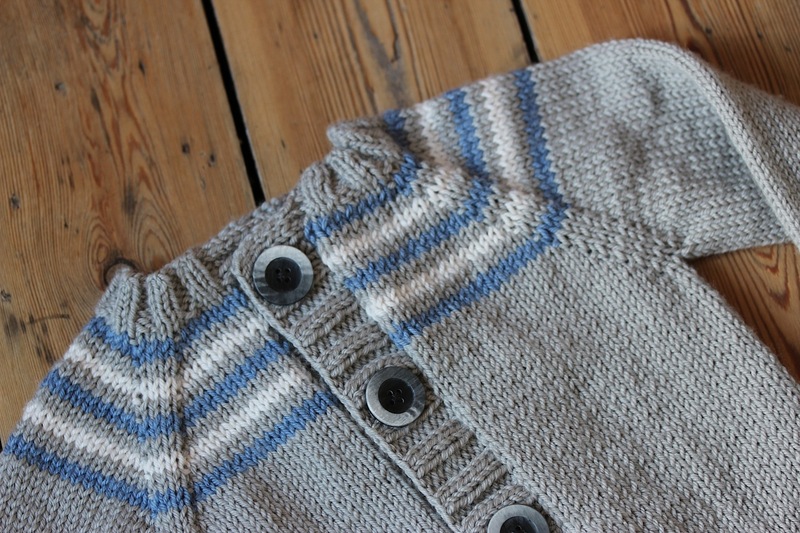 Anyway, a few notes on the jumper itself for any other knitters out there. However, though I was pleased with the jumper once finished, I did have a few issues with the pattern. Firstly, it is by far the vaguest knitting pattern I have ever read. It includes such useful instructions as, for example, “purl the next row, decrease by 28 stitches”, with no indication of where to make the decreases. 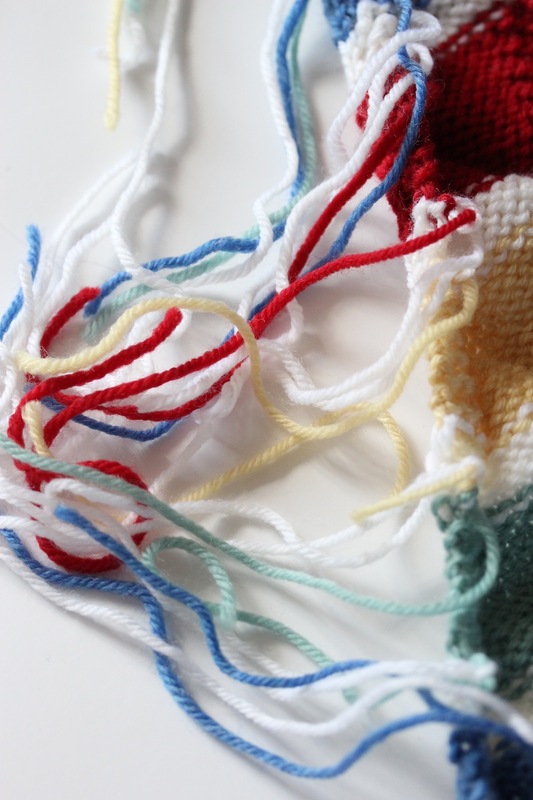 Which meant I spent ages trying to work out how frequently to purl stitches together in order to make an even decrease from 77 to 49 stitches. The arms also came up very skinny – I had to frog the first one and re-knit because it just looked like there was no way I could get them round a toddler’s actual arms, and a skinny toddler at that. And the neckline is pretty tight, though that could well be a problem with my casting off too tightly. Other than that, I followed the pattern pretty much exactly, though I made the ribbing at the waist, arms and neck a contrasting yellow, which looks rather brilliant (she says, humbly). Now, I have a hat to complete that I promised someone before Christmas and then I think I’m going to try out a blanket from We Are Knitters to go with our new sofa. Are you working on anything nice at the moment? The transition from December to January has had me in a flurry of planning, organising and new starts, in a way it doesn’t normally. Typically, the start of January sees me sitting in a post-Christmas fug, depressed about the lack of availability (or acceptability) of a Bucks Fizz for breakfast and wine at lunch and feeling too cold, bleak and depressed to leave the house. But for some reason, this year, I am full of verve and vigour and (dare I say it) resolution. I’ve been knitting up a storm in the evenings, capitalising on the pre-Christmas bobble hat knitting with a jumper for the sproglet that has been all but completed in a fortnight. Actually, though I say this, it has been sitting in a little neglected slump for the past few nights, waiting for me to sew the side seams together – the solitary remaining task before it’s ready to wear. Why oh why is sewing up the seams and knitting in the ends such a dreary end task to the joy of knitting an item?! After that, I have just one more bobble hat to make for a friend and then I think a pair of mittens for the littlest will be the next thing on the needles. Anyone happen to know of any good patterns for toddler mittens? Oh, and that our oft-maligned (in this blog, at least) greenhouse was removed yesterday so it’s crunch time for making the decision about what will go at the bottom of the garden. Despite the support for option three, (the micro pig option) I am pretty sure I’m going to be sensible and stick with option one: a small shed-slash-greenhouse, along with some raised veg beds. And perhaps a cute (twee?) white picket fence and gate to separate off the far end of the garden from the rest. Thursday saw me up in Regents Park, back at my garden design course again; the second week of the year and we were set our first assignment. I am chomping at the bit with excitement about everything we’re doing this year. Our final project is to design a show garden and our tutor told us about a student from a few years ago who submitted his show garden from the assignment to Hampton Court Flower Show, was accepted, and won a gold. So, yup, that’s the dream now. Aim high, right?! I’m a member of a couple of Facebook Mum’s groups. You know the kind – they’re started for people who live in a particular area, to sell and buy second hand kids stuff, and gradually everyone within a 20 mile radius has joined and there are 5,000 Mums chatting away non-stop about why the kids don’t sleep, what on earth that weird rash is, and occasionally selling and buying things as well. The other day, I saw a request on one of the groups from a Mum who wanted someone to knit a couple of ear-flapped bobble hat for her twins. She had the pattern and the yarn, but just realised that she didn’t have the time to make them herself. Was there anyone out there who could, and if so, how much would it cost? I watched the update for a while, checking on the comments coming in, assuming that someone else would jump at the chance. 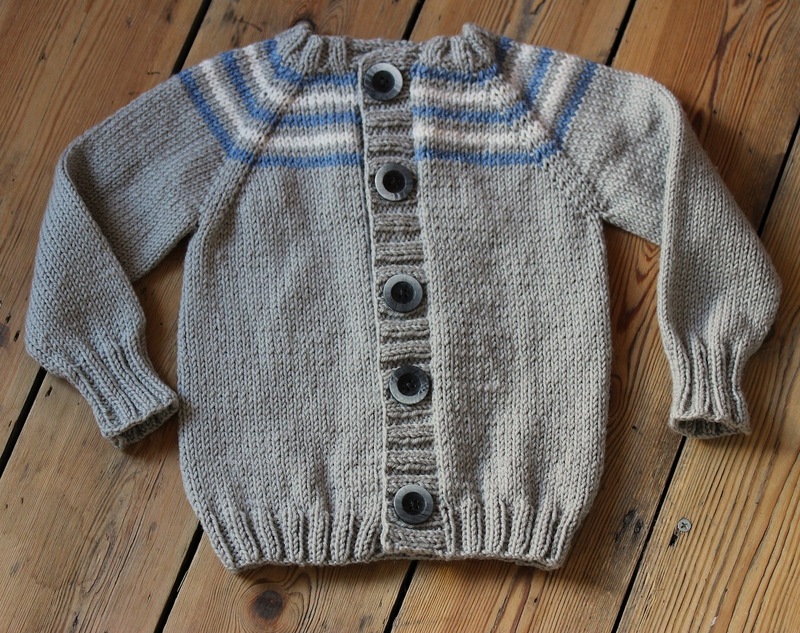 I’ve been meaning to get back into knitting recently, not having picked up the needles since I made the sproglet’s cardie last winter, and I ummed and ahhed about whether to say I could do it. Because, you know, on the one hand it’s a bit of money for knitting, which I enjoy doing. But then again, I long ago worked out that there was no way in the world you could make any money hand knitting anything, unless you had a nearby coterie of millionaires who wanted to buy from you. But in the end, I left a comment saying I could do it, and the Mum accepted. I also linked to my Ravelry page, just so she could see that I did know how to knit. And then the other responses came flooding in. Within a few hours, I’d been asked to knit a total of eight hats. Eight! But after that, everything started to get a bit stressful. I decided to do a trial knit of the hat in question to make sure it was relatively easy to make. I assumed it would take me a couple of hours. It took more than five. I’d originally thought of asking for £20 per hat, which already seemed a bit steep to me, but I realised that with the cost of yarn (£5-£7 per hat) I would then be making the grand total of £3 an hour. 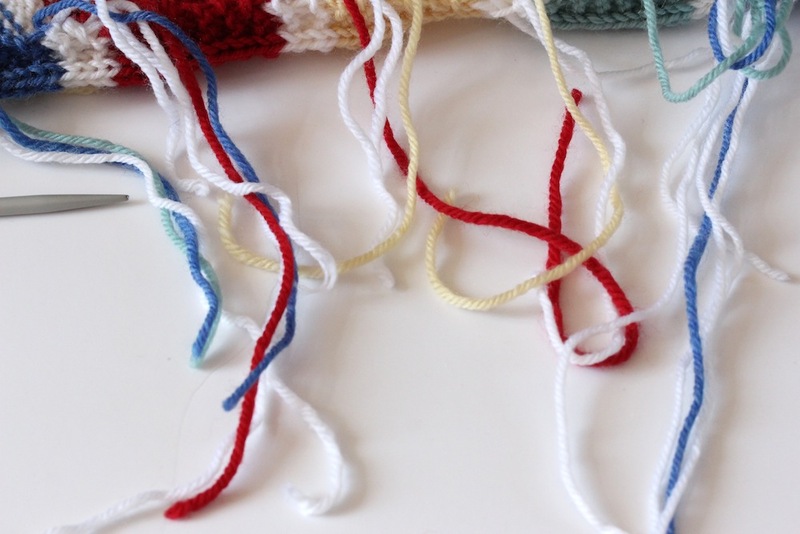 While I do love knitting, having to knit eight hats relatively quickly at that rate just didn’t really seem like something worth adding to a life where I already feel a little squeezed for time. The next person wanted two balaclavas for her grandsons. Buoyed by the last response, and knowing this would involve even more knitting, I asked for £30, figuring I was upping my hourly rate to around £5, which was starting to make it vaguely worthwhile, but obviously still less than pretty much any other job. Within seconds I had an embarrassed response saying that she hadn’t thought it would be that much and she couldn’t afford it. Anyway, to cut the rest of the story short, I’ve done little but worry about costs for the last four days and am once again back to the realisation that there is no way to make money by hand knitting, without feeling like a total money-grubber by asking people to part with a lot of money for a knitted item. It’s my fault, of course, for not having worked out a price and given it upfront. But now I’m putting off contacting the rest of the people who’ve asked for hats, not knowing if pitching at £25 will be just what they expected or wildly more than they had imagined. Should I go lower, so they’re not disappointed, and just commit myself to knitting like crazy every evening til Christmas, or should I stick at that amount and simply try not to worry if they say no? Update: I wrote this a week ago and then left it sitting in my drafts for some reason. I have since finished the first pair of hats, a few pics of which are dotted throughout this post. I worried endlessly about whether the person who’d asked for them would be happy with them. She seemed to like them when she picked them up, but didn’t fall to the floor in wonder and amazement, saying “My god! You’re the greatest knitter in the world, how can it possibly be that your fair hands have created something so wondrous and elegant as these perfectly-knitted hats?” which I think would have been the only response to calm my concerns about various things like size of bobble and evenness of stitches and whether the turn up was a little too tight etc etc. I also approached the next person on the list who had asked for a hat and said it would be £25. She replied and said that, actually, she was moving to Australia so probably didn’t need the hats after all, which seemed a rather unlikely response, having asked for me to make them a mere day before, so I suspect that she thought it was too much money. So, I am currently frantically knitting away at the next pair, to try and finish them before tomorrow and I have spent most of the past few days worrying that the yarn I’ve used isn’t soft enough and that she is going to be disappointed with the end results. I then have one more to knit — for a friend — and after that I will put away my needles for any attempts at making money and use them only for knitting for family and friends as presents. The hat, though, I should say, is pretty awesome and the pattern is great. If you’re a knitter and are in the market for a bobble hat with earflaps then I recommend it! More details over on Ravelry for anyone interested: Earflap helmet hat. My knitting has taken a bit of a back seat these past five months. After the knitting-nesting frenzy before sproglet mark II was born, my needles have been consigned to the needle holder, evenings these days not given over to knitting a gorgeous blanket, so much as slumping, weary, in front of the TV, too tired to even change the channel if the remote control happens to be out of hand’s reach. But no longer, my pretty needles! Autumn is truly here, the days are shorter and colder and knitwear is needed in this house. 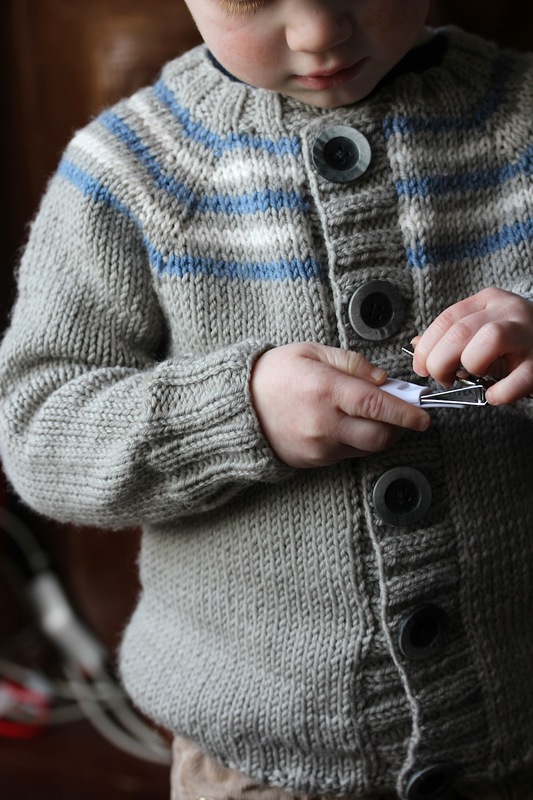 The elder sprog has outgrown most of his jumpers from last winter so I spent a particularly wonderful 10 minutes last week going through saved cardigan patterns on Ravelry with him, asking him which ones he liked best. And so it was the wonder years cardigan by Elizabeth Smith was selected. 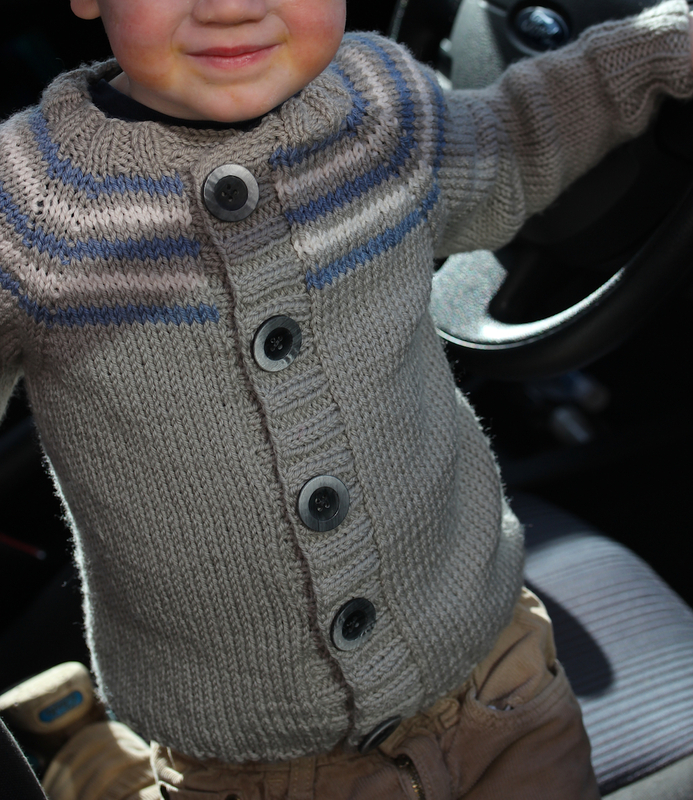 The sprog liked the stripes, I liked the comfy Grandpa look of it and the leather buttons. 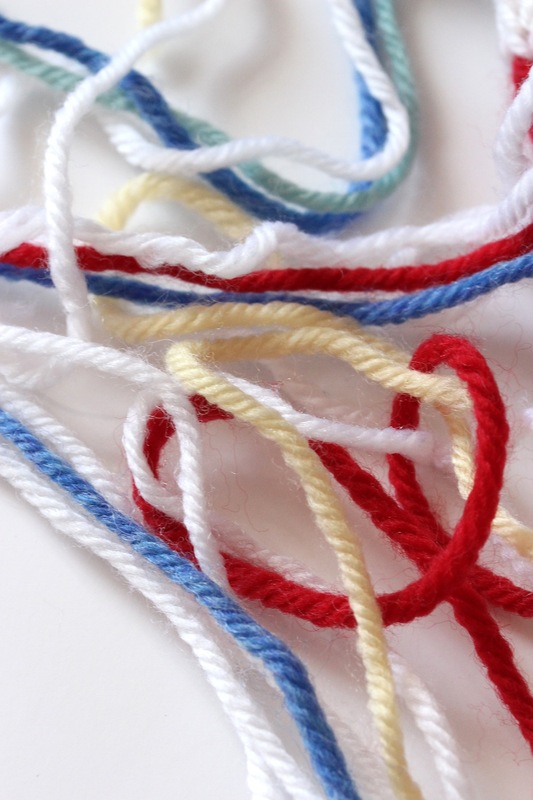 By amazing good fortune, I was lucky enough to win tickets to the Knitting and Stitching Show, taking place later this week at Ally Pally, from the very lovely This Blog is Not For You. What better place to choose some lovely squishy wool? So, with a bit of luck, evenings from now on will be taken up with hot chocolate, knitting, oh, and still a bit of telly too. I’m all talked out by about 7pm nowadays, so vegging and staring is the only option. A glorious array of plastic! P.S. 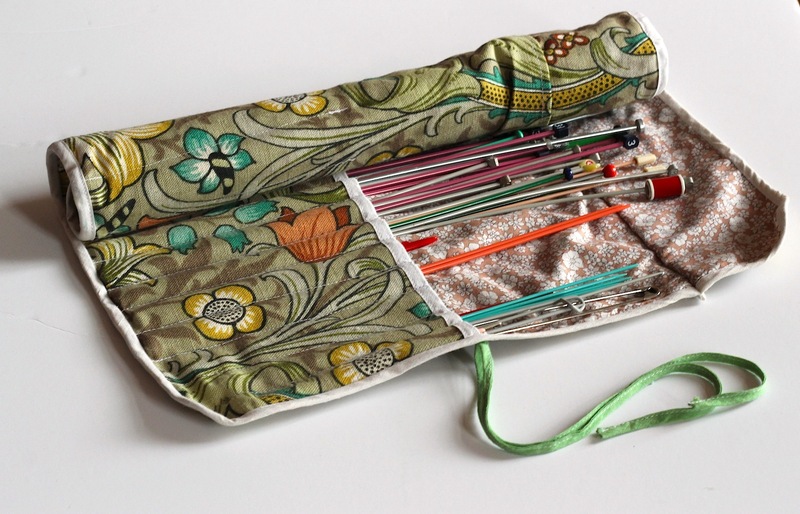 My knitting needle case is rather lovely, isn’t it? It was my Granny’s, acquired when she went into a home, at the same time as the bronze urn on my mantelpiece. I assume that she made it herself — I think the outer fabric was probably from some curtains she had, and the inner one is, I believe, Liberty print. 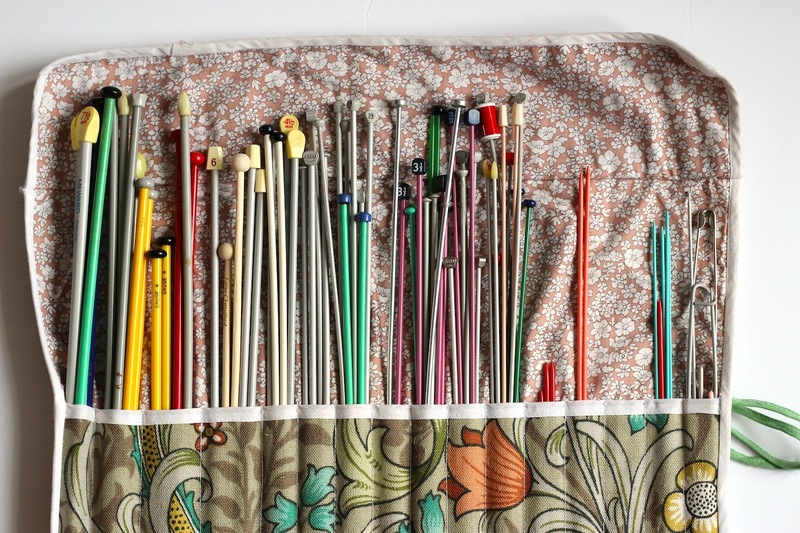 Most of the needles inside were hers as well; I love their fabulous rainbow colours. 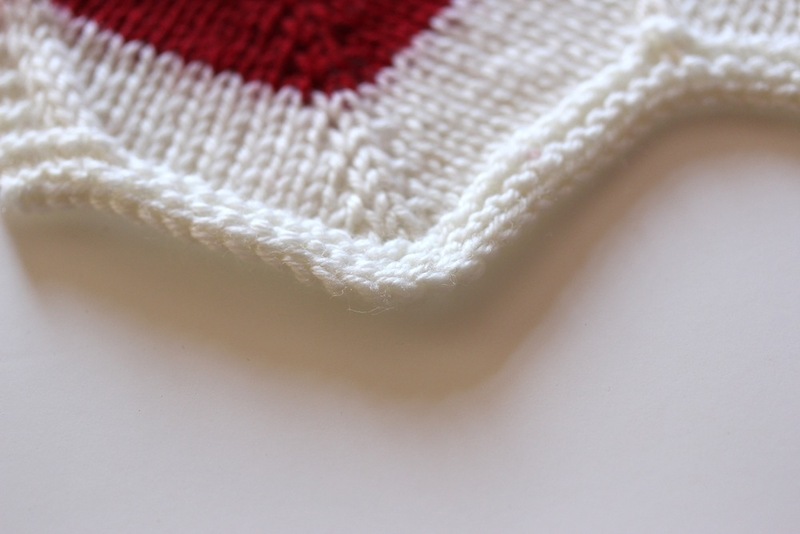 Prepare yourself, gentle readers, for some photos of… …my favourite thing I’ve ever knit! Whipped up in a mere few weeks of late-pregnancy knitting fever, I present to you this rainbow chevron baby blanket, a present for my brand new nephew. I dillied and dallied about what to make for him, knowing that he was due to arrive a few short weeks after my own latest baby and that, newborn in arm, I was unlikely to manage to get anything done, so I had to have this finished before my own babe appeared. Luckily, the knitting haze descended and I was done in good time. 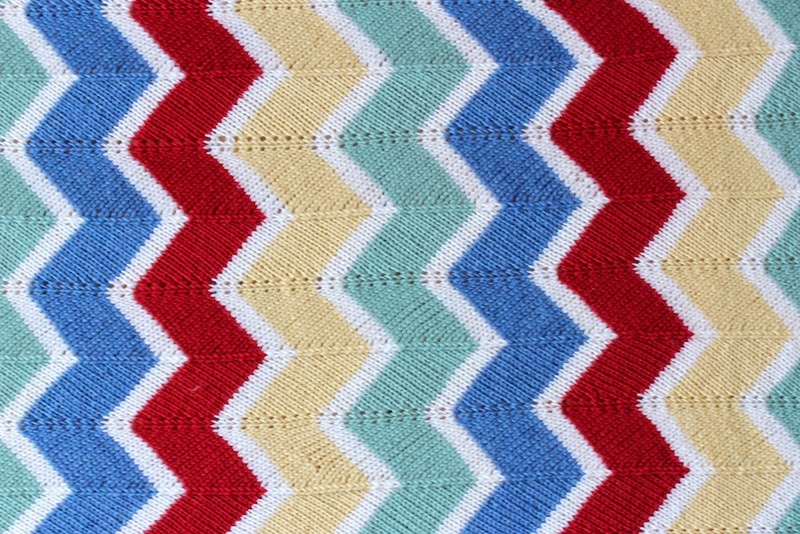 The pattern is a free one, available on Ravelry, the chevron baby blanket from Espace Tricot blog. and the wool is Wendy merino DK. 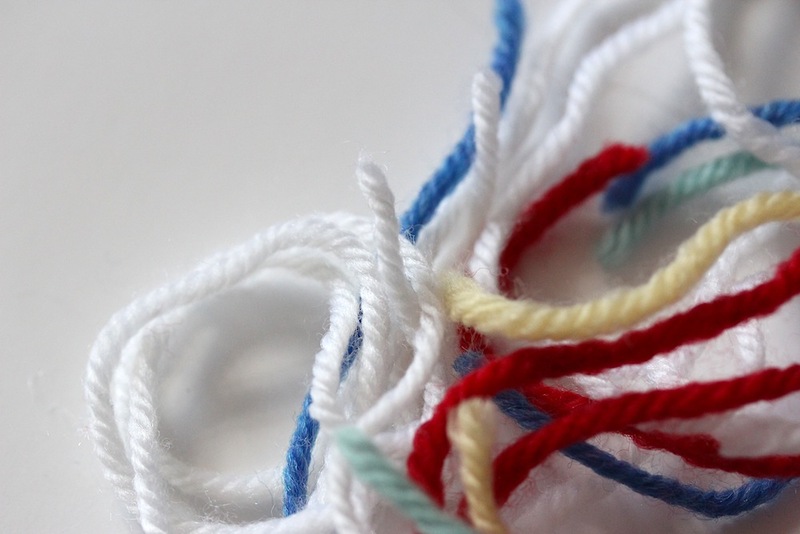 I decided to make an abbreviated rainbow of red, yellow, green and blue, with a small line of cream in between each colour and I adore how it has turned out. I heartily recommend the pattern. Very straightforward to follow, but definitely more interesting than a non chevron (fully garter stitch) version would have been to knit. The construction is deeply pleasing to me, the decreases leading to the lovely triangular shape with little effort. I didn’t make the ends too pointy with the blocking, but just let them gently curl as they were. The only downside to the whole project was the tedious sewing in of ends. There were a lot to do. 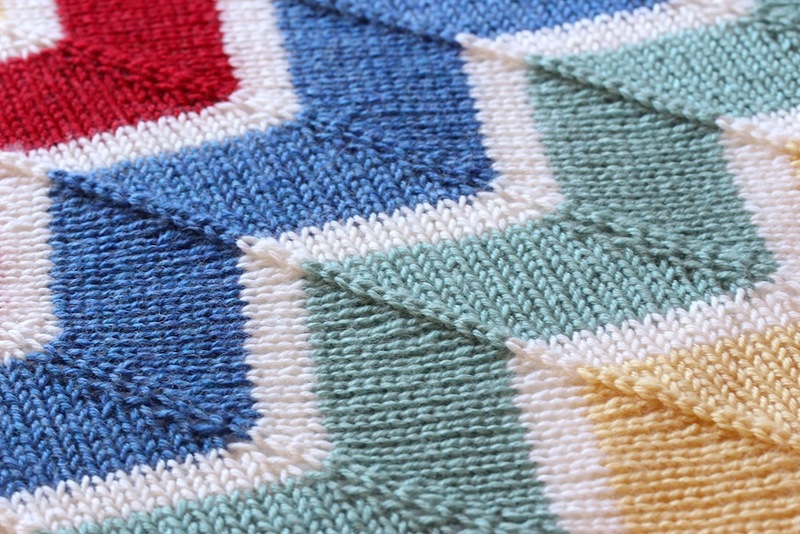 Full project details, as ever, over on Ravelry: zig zag baby blanket. I can’t be the only knitter who absolutely hates sewing in all the yarn once the project is finished. Sometimes, it can take me as long as it did to knit the entire thing to actually get around to binding in all the loose ends. So, if you share this aversion with me, pity me right now. For this is what awaits me now I have finished my latest project (the one I was agonising over starting a few days ago).